Official Army Of The Pharaohs and Demigodz emcee Blacastan has been steadily staking his claim to the title of ‘savior of underground rap music’ since his debut mixtape Me Against The Radio and its key cut and video "Life Of A Tape" became an underground cult classic in 2007. 2014 saw Blac teaming up with producer and longtime AOTP and Demigodz collaborator Stu Bangas for the first installment of Watson & Holmes. 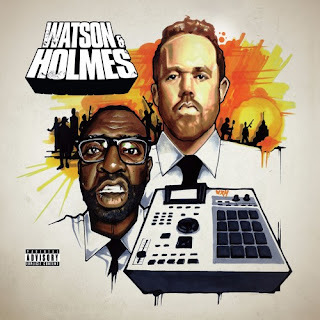 Now the duo is back with The Uncanny Adventures of Watson & Holmes, a sophomore effort that improves on the first in every way. Stu gets completely brutal with the beats, and Blac ups the ante on the rhymes. Plus, they’ve enlisted Ill Bill (Non-Phixion, La Coka Nostra), Nutso, Apathy (Demigodz, AOTP) 7L & Esoteric (AOTP, Czarface), and Tragedy Khadafi to lend their talents to the project. For the first leak the twosome drop the Tragedy featured banger "Ware Crimes" where we can see the overall sound continues from the first project. Blacastan & Stu Bangas The Uncanny Adventures of Watson & Holmes will be released on 6-9-17 via Brick Records.